The Jaguar XF has yet again won a 'car of the year' award. This is its fourth important title win since being launched in March. This time the premier award comes courtesy of Auto Express in its New Car Honours 2008. Jaguar's multi-award winning sports saloon claimed its crown following victory in the 'best executive car' category, ahead of the BMW 5-Series, the Mercedes CLS and E-Class, the Audi A6, and the Lexus GS. 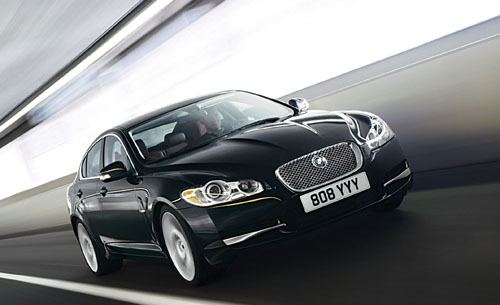 An Auto Express spokesman said: "Jaguar’s XF is a machine that has proved the doubters wrong. It’s a car that impresses on every level, from design to drivability, practicality to price. But that’s not the only reason why our judges chose this car. Our winner has raised the standards in a class where excellence is considered the norm." What Car? magazine, What Diesel? magazine and The Sun Motoring also named the XF 'car of the year', while Top Gear magazine hailed it their 'limo of the year'. Other notable awards include 'interior of the year' from CAR magazine and the 'design award' from Autocar magazine. Most recently the optional top-of-the-range 440 watt Bowers & Wilkins in-car audio system in the Jaguar XF was voted best buy under £100,000 by The What Hi-Fi? Sound and Vision Ultimate Guide to High End Entertainment. Priced from € 67,380 for the 2.7-litre diesel, the XF comes as standard with a generous specification featuring a host of innovative, industry-leading equipment. Highlights include the new JaguarDrive Selector™ and JaguarSense™ - a smart technical solution introducing touch or proximity-sensing control for overhead console lights and glovebox. Thanks to the award winning XF sports saloon, Jaguar in Ireland achieved the highest increase in new car registrations in the Jan-July period, up 21.8 per cent, while the overall car market declined by 15.1 per cent. Page generated in 0.1117 seconds.